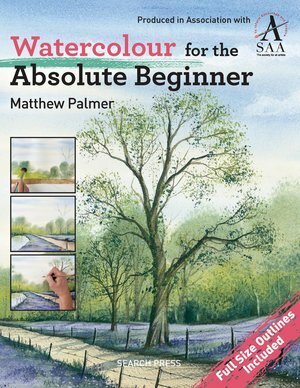 This book is a comprehensive course in watercolour landscape painting by expert Society of All Artists tutor, Matthew Palmer. Matthew is renowned for his beautiful, detailed paintings and his ability to teach effective painting using simple techniques. He teaches over 150 pupils per week and also appears regularly on TV. The book begins with excellent advice for the beginner, including, easy drawing for painting, composition, easy perspective, light and shade, colour, and how to paint skies, tree, water and figures in watercolour. There are then six simple step by step painting exercises, and each exercise leads into a more developed step by step painting project, including a windmill, seascape, snow scene, mountains and lakes, bluebell stream and an all-rounder featuring a landscape with buildings and figures. The exercises are ideal for beginners and the main projects will also build skills for improving artists. A pull-out outline drawing is provided for every exercise and main project, and Matthew shows step by step how to transfer these onto watercolour paper. Like best-selling artist, Terry Harrison, Matthew has an accessible style, plenty of tips and tricks for beginners and his own range of brushes and colours to make things easier (though readers can use alternatives).